See sea stars in the intertidal during an upcoming super-low tide. 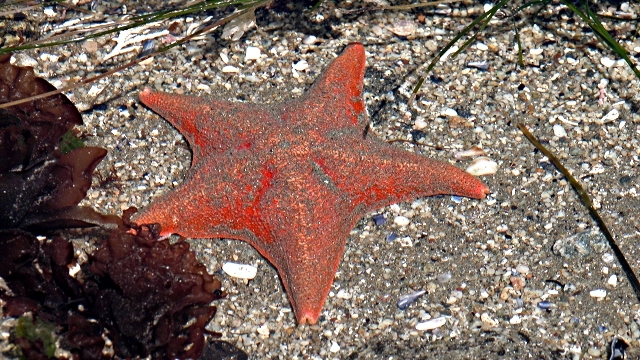 See sea stars in the intertidal during one of the upcoming super-low tides. QUEST blogger Andrew Alden’s recent post about Bay Area Tides got me thinking about pulling on my rubber boots and heading out to the intertidal during an upcoming low tide. In the next few weeks, we’ll get some really low tides during daylight hours—a great opportunity to see the organisms that live on the narrow edge between the land and the ocean. Tides are caused by the gravitational pull of the moon and the sun. (See Science on the Spot: Watching the Tides for a nice, clear explanation.) The moon is a lot closer to the Earth than the sun is, so the moon’s influence on the tides is far greater than the sun’s. But sometimes, the sun and the moon can join gravitational forces and all that gravitational pull can create some really high (and really low) tides. Each year around January 2, Earth, in its elliptical orbit, is closest to the sun. Here, the sun’s gravitational pull on Earth (and Earth’s water) is strongest. The gravitational pull of the moon combines with the gravitational pull of the (relatively) nearby sun when the moon’s position is such that the Earth, sun, and moon are aligned in a straight line. This creates the highest high tides and the lowest low tides of the year. The exact dates vary each year, because it depends on where the moon is in its orbit. Usually we get these super high/super low sun-plus-moon tides, also called King Tides, in December and January. (When the earth is at the point in its orbit that is farthest from the sun, around July 2, and the moon is aligned just right, we also get super high and super low tides.) Super high tides can give us a preview of sea level rise and help us identify areas that are prone to submergence. And when the tide goes out, super low tides are a great opportunity to go tidepooling! There are quite a few great tidepooling spots in the Bay Area, including Fitzgerald Marine Reserve, near Half Moon Bay. QUEST producer Joshua Cassidy made a fantastic short film about intertidal life in the Reserve. Natural Bridges State Beach in Santa Cruz is another great intertidal area. To see photos of some of its marine life, check out the QUEST Natural Bridges Tidepools Exploration (and see a fun audio slide show I made while I was an intern at QUEST). My personal favorite place for tidepooling is Duxbury Reef, which is part of Point Reyes National Seashore and is close to Bolinas Lagoon. It has a really flat, rocky bench, and at low tide you can walk way out. Check out the turban snails (there seem to be zillions at this site), and the different species of seaweed (my favorite intertidal inhabitants). If you’re into identifying things and learning about intertidal ecology, there are a lot of great books out there: Seashore Life of the Northern Pacific Coast has nice color pictures, and Between Pacific Tides is a classic. Wear rubber boots with a rugged sole (that seaweed is slippery) and maybe bring a magnifying glass or hand lens. Keep your wits about you, and look up and look around often so the tide doesn’t sneak in on you. To choose a good day to go tidepooling, you need to look at a tide table, which lists the predicted times and tidal heights of all the high and low tides throughout the year. You can often get a tide table for your area at a local surf shop or bait shop. Or, check out NOAA’s Tide Predictions, which has tide tables for tidal stations throughout the country. (Tidal stations are places where the height of the water is measured regularly—often along with weather data. San Francisco’s tidal station is the oldest continuously operating tidal station in the western hemisphere, a fun fact I learned in the Watching the Tides video!) Find the tidal station closest to your tidepooling spot on NOAA’s map. My favorite, Duxbury Reef, is closest to the Bolinas Lagoon station. From the Bolinas Lagoon Station’s tide predictions page, download the station’s tide table—click on the Published Tide Tables Formats on the top right. Look for dates with a nice, low tide—something below 1.0 feet is generally pretty good, depending on the site. To time your visit, it is helpful to look at graph of the predicted height of the tide throughout the day. You can generate a graph for any day this year. In Northern California, wintertime low tides occur in the evening; find out what time the sun sets and plan to finish your intertidal excursion before it gets dark. We have some great low tides coming up on December 9, 23, 24, and 25—with heights at -0.9 feet—so ask for rubber boots for Christmas!